The great war photographer revisits public triumphs and private tragedies over the course of a tumultuous career. 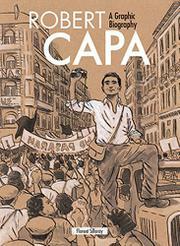 Speaking in the first person, Capa shows how he earned his reputation on front lines from the Spanish Civil War to the French defeat in Southeast Asia and on other major assignments along the way. In between he recalls personal and professional struggles, hobnobbing with the likes of Ernest Hemingway and Pablo Picasso, and multiple affairs, most notably with fellow photographer Gerda Taro and Ingrid Bergman. His monologue is delivered in a small, faux hand-lettered typeface that captions neatly squared-off sepia panels of boudoirs and battlefronts drawn in ink with white highlights. Celebrities and associates are recognizable, but most figures are too loosely rendered to judge ethnic origins except from context. The art and spare narrative voice combine to give the memoir a somber, distant feel, but some sequences, such as the D-Day landing at Omaha Beach in which the photographer, cursing in English and his native Hungarian, struggles to get his shots as troops are dying on every side, are nightmarishly vivid. Though none of Capa’s photos are reproduced here, Silloray adds visual references to many of the more iconic ones; readers who go on to seek out the originals may be surprised at how many are part of our enduring cultural legacy.